The crested gecko (Correlophus ciliatus) is a lizard that comes from Southern New Caledonia. For numerous years, these geckos were thought to be an extinct species until someone rediscovered them back in 1994 and soon became a popular pet around the world. They are mostly nocturnal and prefers to live in trees and in the wild, you can find them sleeping in the rainforest trees during the day but at night, they will be active and hunting for food. In captivity, they can live up to 20 years. This is a factor to take into consideration before deciding to get one. An adult crested geckos can measure from 6 to 10 inches long including their tail. These geckos distinct feature is that they have eyelashes. Some people call them eyelash geckos. They don’t have eyelids and they clean their eyes with their tongue to keep them moist and remove any debris. When I saw my gecko do this for the first time, I was surprised and intrigued. 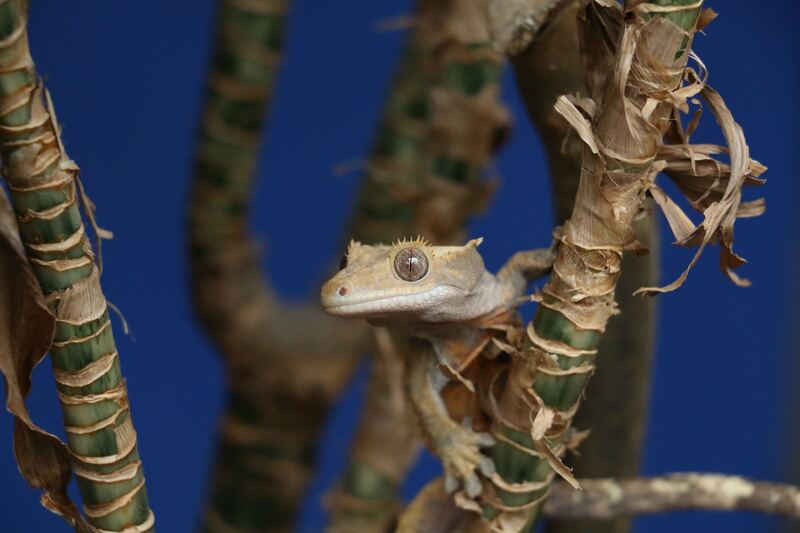 Although they are very jumpy when young, the crested geckos are very docile animals. They are quiet and a great pet to own. With consistency, it is very easy to tame and care for them. As for diet, although it is good to give them insects when they are young for promoting growth, they don’t require it to live a healthy and happy life. They require a smoothy-like diet, which you mix water to a powder mixture. The most popular brands are Pangea and Repashi. If you are leary of giving insects as food, this gecko is just for you! Crested geckos are little clowns and mine never fails to put a smile on my face when I come home and see them in those funny and crazy positions. **** If you have any questions about crested geckos, don’t hesitate to comment below or send me a quick message through my contact page and I will answer at the best of my ability or will get the answer for you through a proper channel.